In 1976, the militant workforce within Lucas Aerospace were facing t layoffs. Under the leadership of Mike Cooley, they developed the Lucas Plan to convert the company from arms to the manufacture of socially useful products, and save jobs. The plan was not put into place but it is claimed that the associated industrial action saved some jobs. It's a model to enact a just transition from ecologically damaging to ecologically positive employment in a low-carbon economy, where certain industries will have to shrink- for example, the power generation, aviation and cars. However, instead of a net loss of jobs, efforts must be put into creating green jobs or ‘converting’ old jobs. to produce the hardware for harnessing renewable wind and solar energy- employing skilled engineers and training new engineers for the future. The Plan, drawn up by workers on the shop floor, contained over 150 ideas with detailed plans. The issue of climate change was not so well known as it is today, but there was a problem of oil supply and the Lucas plan focused extensively on the development of alternative, renewable energy. Plans included:: Efficient wind-turbines, Solar cells and heat pumps, The “Power Pack” to create cars with 80% less emissions and 50% greater fuel economy, an efficient method for small scale electricity generation and a vehicle like a train but with pneumatic tyres allowing it also to travel on roads. However, the importance of the Lucas Plan is not the specific technologies and products but in the questions iraised about production under capitalism and the vision it offered of a new society in which human needs come before the blind pursuit of profit. The Green Party, had a mixed response to the Paris COP, which wouldn't have happened without vast amounts of organisation by NGOs. Even The Economist recognised the importance of bottom-up pressure in getting an agreement at all. Yet it was a flawed agreement with no recognition of human rights, or that richer countries need to help poorer ones. Above all, there were no mechanisms to enforce compliance with the agreement. This was in large part due to public and private lobbying by fossil fuel corporations against a binding agreement. Many governments, like the UK, are still encouraging fossil fuels through fracking and subsidies. The jail sentences for the Plane Stupid protestors against Heathrow expansion indicate that the state will deal harshly with future climate activists trying to enforce the agreement. The Green Party needs to bring the struggles against climate change into our communities and everyday lives. Projects such as monitoring air pollution caused by motor vehicles show the link between climate change and our health; they can empower individuals and provide vidence to challenge inaction by the authorities. But the problems addressed by the Paris COP are rooted in global capitalism and its relentless pursuit of consumerism. Alongside political agreements, Greens must continue to promote the notion that people (particularly in rich countries) should work and consume less if we are to save the planet from irreversible climate catastrophe. A Citizen’s Income could be important to redistribute work, wealth and income away from production and growth. The Green Party needs to work with as wide a range of interests as possible - if we are going to have a hope of implementing even the flawed, limited targets of COP21. 'Green Left believes it is important to have a democratic anti-war coalition at both a national and local levels committed to involving all those groups and individuals wanting to campaign in a pluralist manner that carries the trust of the movement. The existing national Stop the War Campaign (STWC) has lost its way and is in danger of being a hindrance to building maximum unity that is so needed to build the anti-war movements in the UK. Unsurprisingly parents did not see the letter and the threatening tone as legitimate when their children had not been charged with any crime and no evidence was presented. Similarly Muslim parents have expressed concern about the way Prevent targets their children and treats all the diverse Muslim community as potential terrorists. Prevent demands spying of school staff, youth workers, health and social workers, who have a statutory obligation to report signs of ‘extremism’, including non-violent behaviour,. Their representatives express concern that this undermines with a whole community and alienates young people. Prevent are supporters of terrorism. The essence of education is challenging, free discussion of ideas Prevent Strategy appears to be impeding this as students censor themselves for fear of being reported and teachers avoiding discussions so that they do not have to report students. You need to be a Green party member to join Green Left and it is a good time to restate the case for joining Green Left. 1. Green Left offers a comradely space to discuss ideas and to organise. 3. Green Left is about outreach, for the Green party, to socialists and other radicals We aim to give such people the confidence that they are joining a party of the left, where their political thinking will be welcomed. 5. 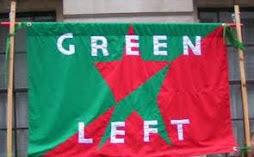 Green Left’ aims to to raise Green party politics to meet the demands of its radical policies., Green Left helps the Green party t to focus on its fundamentally radical philosophy. In short, Green Left works to enable you to live in a society based on peace, ecological balance, economic equality and inclusion. The refugee crisis: What will summer bring? What next for community energy? Can the Greens work with the Labour Party? Ecosocialism IS the future. The Green Party plays an important part in politics, but also engages with other Left activists to campaign on issues where there is common ground. How can we work with Jeremy Corbyn, Labour Left and other appropriate Left thinkers and activists in future? The Government's 'Prevent' Agenda is supposedly aimed at addressing Extremism. It has come in for heavy criticism for having a negative impact and for fuelling Islamaphobia. A speaker from Muslim Engagement and Development (MEND) will speak on how Greens and Muslim groups can respond. 40 years ago Lucas Aerospace workers planned to avoid defence industry job cuts by producing socially-useful alternatives, from wind turbines to kidney dialysis machines. See the film of the 1976 plan and discuss how we can Stop Trident and create green jobs to transition our economy from austerity to hope. #StickItToTheTories is a UK-wide sticker distribution campaign that is LAUNCHING NOW! ‘Stick it to the Tories’ is a sticker campaign that West Wales People’s Assemblies are launching in to distribute anti-austerity, anti-cuts, and environmental stickers of the left movement. The concept is simple. Individual activists, local campaign organisations across the UK can not only source all their political stickers from #StickItToTheTories cheaply at www.stickittothetories.org.uk but they can also request designs and contribute to the creative design of new stickers which everyone will be able to access. For this purpose we have set up a Facebook page: “Stick It To The Tories (Sticker Design Page)” can be found here: www.facebook.com/groups/1649695695309745/ where anyone can come and request or help to create new stickers. ‘Stick it to the Tories’ is, and always will be, a not-for-profit organisation. We will sell these stickers at the cheapest possible price we can get them out for. We must get our message out so that people en can see that we are not beaten. that a movement is rising, people are organising and we will not be beaten down no matter how many laws try to silence our dissent.